Next Monday on April 8th Shivtr will be moving to the Linode cloud hosting platform. Shivtr currently runs primarily on dedicated hardware, which has the drawback of being difficult to scale. Our traffic varies quite a bit and can spike with popular new game and expansion releases. To better address this we want to be on a more easily scalable solution, and after researching several options we liked Linode's flexible server plans and customer service the best. Linode allows us to spread out the services we use to their own linodes (virtual machines) and scale them as needed for extra performance. If your site uses a Shivtr subdomain, such as *.shivtr.com or *.wowhordes.com, you won't need to do anything. Once the move is complete your site will simply be running on our new servers at Linode! However, if your site uses a custom domain name, you will need to update its IP address to point to our new server. When we begin the transfer, the old server will display a maintenance message, with a note showing our new ip address and help on how to update your domain name. Level Up! Shivtr Turns Twelve! It's time for cake and candles, today marks Shivtr's twelfth birthday! Shivtr started out as a home for our WoW guild more than a decade ago, and has grown into one of the most popular guild hosting services used by millions of gamers worldwide! We love our amazing customers, and hope we can continue providing a great home for your guilds in 2019 and beyond! We have been notified by our hosting provider (SoftLayer) that the pod our servers are located on needs upgrades, and we are being required to move our servers. We have been working on this for the past few weeks to ensure a smooth transition and plan to initiate the move on Friday July 6th. Due to the size of Shivtr's database, we expect the transfer to take about 8 hours to complete. If your site uses a Shivtr subdomain, such as *.shivtr.com or *.wowhordes.com, you won't need to do anything. Once the move is complete your site will simply be running on our new, shiny hardware! Level Up! Shivtr turns Eleven! 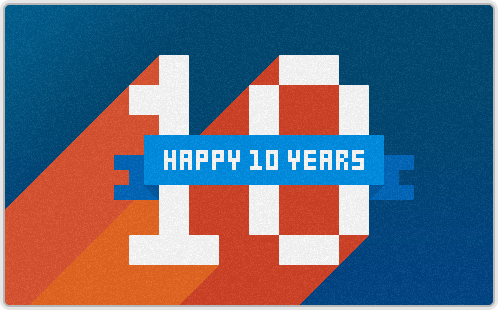 It's almost hard to believe, but we launched Shivtr eleven years ago on this day! Yes, today is Shivtr's 11th birthday! 2017 has been an interesting year with the announcement of Classic WoW. Almost a return to our roots! We got our start with WoW so it will always hold a special significance to us, as Shivtr was once simply an awesome website for our WoW guild. Now it has grown to become one of the most popular guild hosting services around, home to more than 2 million gamers and serving millions of page views every month! Level Up! Shivtr Turns Ten! Ten years ago, Shivtr was created with the goal of providing a great website for our WoW guild, and over the years has grown to become one of the most popular guild hosting services around, home to nearly 2 million gamers and serving more than one billion page views! This milestone is really a celebration of our amazing customers, as you guys drive us to continue tweaking and patching Shivtr after all these years. Shivtr has seen over 3,500 patches to our codebase in the past 5 years, and we have been hard at work on several big projects for 2017 to ensure Shivtr remains a great home to your gaming community!